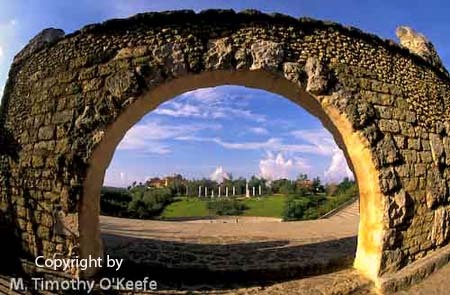 The arched stone doorway leading to the amphitheater appears to lead to nothing but empty sky. Once you walk through this rock portal, you will find yourself suddenly on the brink of a high cliff. And standing above a view that should instantly transport you back over thousands of years. Spread out below you is an immense, 5,000-seat Grecian-style amphitheatre with row after row of tiered seats unfolding accordion-like down to a tiny wooden stage. The huge semi-circular stadium, gleaming and bright in the hot Dominican sun, is both grandiose and impressive, worthy of hosting Socrates himself. At first view you may find the massive amphetheater not only grandiouse and overwhelming but also puzzling. An ancient Grecian-style amphitheatre is the last thing any of us expect to see in the Dominican Republic. Does it make any more sense than the Altos de Chavon's replica of a 16th century Mediterranean village? Yet the amphitheater is a legitimate performing arts stage. When it opened in August, 1982, its inaugural Concert for the Americas featured Frank Sinatra with Buddy Rich, the rock group Heart and guitarist/singer Carlos Santana.